DeVilbiss Traveler Portable Compressor Nebulizer System is an ideal travel nebulizer machine for asthma. It consistently turns liquid medicine to aerosol therapy and delivers it to the lungs in uniform concentrations at the touch of a button. Devilbiss Traveler Nebulizer is small, lightweight and most portable compressor nebulizer in the market. DC car adapter for nebulizer or optional Devilbiss 6910D-601 traveler replacement battery makes it easy and convenient to nebulize while travelling. How to Operate Portable Nebulizer Compressor? Connect one end of the nebulizer tubing to the compressor air-outlet connector. Note: During high-humidity weather conditions, condensation (water build-up) can occur in the nebulizer tubing. If this occurs, after the treatment operate the unit with the tubing connected but without the nebulizer to dry the tubing. Assemble clean nebulizer parts by placing baffle down in medication cup. Add prescribed medication into the medication cup. Holding cup stationary, screw on nebulizer cap. Assemble mouthpiece and T-piece (if applicable) and insert into the top of the nebulizer cap. If using an aerosol mask, insert the bottom part of the mask directly into the top of the nebulizer cap. Press the power switch "ON" to start the Devilbiss Nebulizer Machine. Begin treatment by placing the mouthpiece between teeth. With mouth closed, inhale deeply and slowly through mouth as aerosol begins to flow then exhale slowly through the mouthpiece. If treatment needs to be interrupted, simply press power switch and insert nebulizer or tubing into the holder. Note: Some physicians may recommend a specific breathing pattern during treatment. If so, follow their recommendation. When treatment is complete, turn unit off by pressing the power switch. Unplug the unit from the wall power outlet if using the AC adapter. All parts of the nebulizer, except tubing, should be cleaned. When the DeVilbiss Traveler Portable Compressor Nebulizer System is turned off, unplug power cord from wall outlet. Disconnect tubing from the air-inlet connector and set aside. Disassemble mouthpiece or mask from cap. Open nebulizer by turning cap counterclockwise and removing baffle. With the DeVilbiss Traveler Portable Compressor Nebulizer System off, unplug power cord from wall outlet. Wipe the outside of the compressor cabinet with a clean damp cloth every few days to keep dust-free. Always unplug the device immediately after using it. Do you have to have a prescription to order this device? No, we do not need any prescription for DeVilbiss Traveler Portable Compressor Nebulizer System. Do you ship to cozumel mexico? Yes it can be shipped to Cozumel Mexico. Doesn't this one come with a carrying case? Do I have to order the carrying case separately? 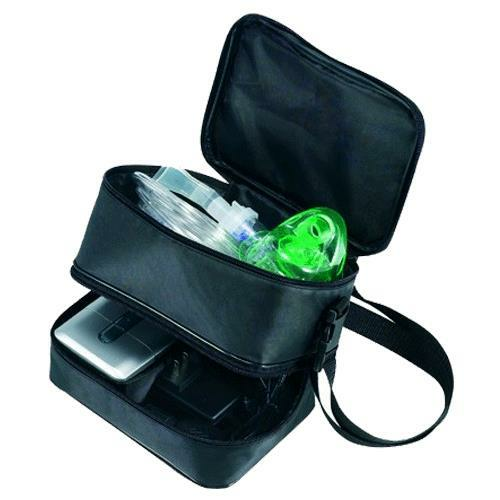 DeVilbiss Traveler Portable Compressor Nebulizer System comes with Easy tote carrying case. Do you need a Drs. prescription for this? You do not require a doctor's prescription to buy/use this item. Just follow the usage directions properly. Can the Devilbiss Traveler Portable Nebulizer rechargeable battery unit be used in South Korea and Japan? 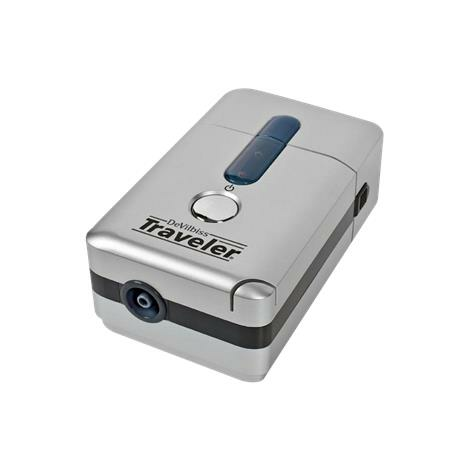 DeVilbiss Traveler Portable nebulizer is 110-220V compatible so it can be used overseas. Yes DeVilbiss Traveler Portable Compressor Nebulizer can be used in Australia and Europe. Yes, DeVilbiss Traveler Portable Compressor Nebulizer System can be used overseas. Does it come with the carry bag, tubing or are those extras? What is the noise level of this device? 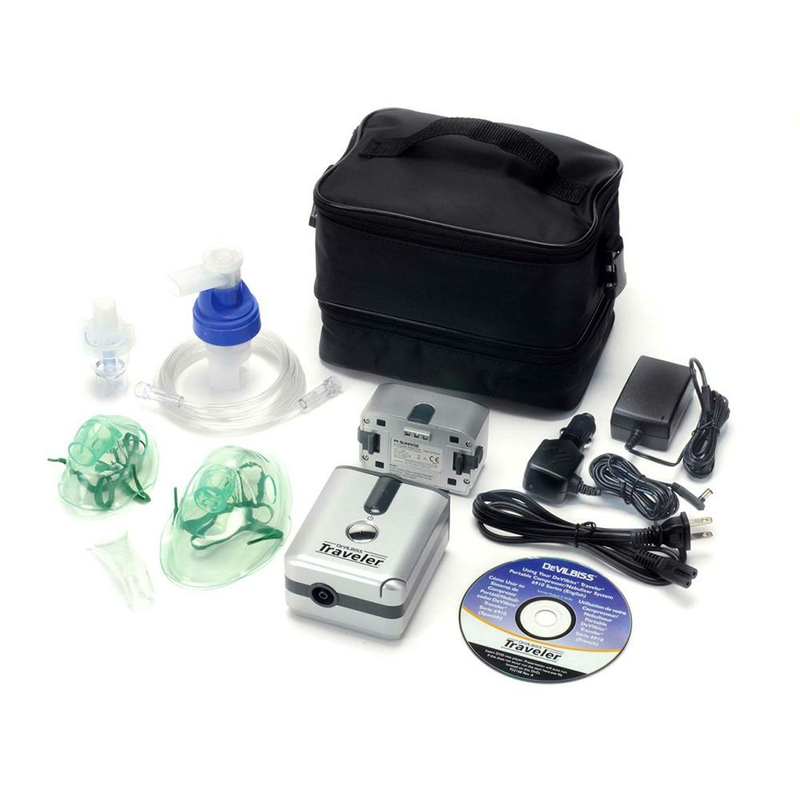 Sound level of DeVilbiss Traveler Portable Compressor Nebulizer System is 54dBA.